Dr. Dhillon is a board-certified physician in medical oncology, internal medicine, and hospice and palliative care. 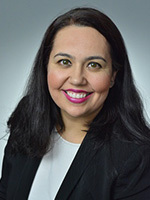 Prior to joining Georgia Cancer Specialists, Dr. Dhillon served as Assistant Professor in the Department of Hematology and Medical Oncology at Emory University. She established and directed the research department at a regional cancer hospital in Georgia. She has special interests in breast cancer and melanoma. She is a member of the American Society of Clinical Oncology and the American Association of Cancer Research. Dr. Dhillon is published widely and has presented at numerous national organizations. She also serves on several non-profit foundations benefiting cancer patients and their loved ones, including Camp Kesem and Combat Against Cancer.